Margaret S. Herridge MSc MD FRCPC MPH is Professor of Medicine, Critical Care and Respiratory Medicine at the Toronto General Hospital/University Health Network, University of Toronto, Toronto, Canada. Her research interests include 5-year outcomes after the acute respiratory distress syndrome (ARDS), 1-year outcomes after the severe acute respiratory syndrome (SARS) and 7 day ventilated critically ill patients and their family caregivers. 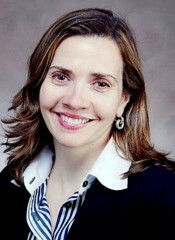 Since 2007, and in collaboration with the Canadian Critical Care Trials group (CCCTG), she has been the co-PI of the multi-phase national RECOVER Program that is developing a patient- and family-centred rehabilitation intervention after critical illness and a national educational program about ICU outcomes. She has published editorials and 2 landmark papers on outcomes after ARDS in the New England Journal of Medicine and is a frequent international speaker on Outcomes after critical illness.